Duck & Goose Hunting in Ontario is very popular. 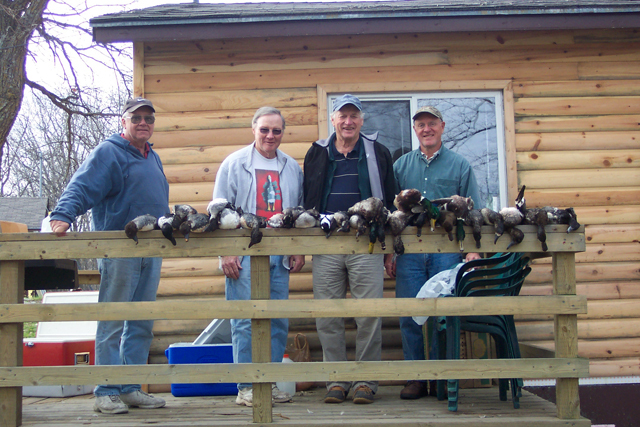 Duck Hunting Trips are successful as Ontario Duck Hunters do not have to go very far as there are usually abundant waterfowl in our bay right in front of our duck hunting lodge. Migratory routes for Ducks and Geese pass right over Lake of the Woods in our area. There are also a variety of rice beds and neighbouring fields and grain fields for waterfowl to feed in. Ducks & Geese have a flight pattern over this area of Lake of the Woods and land in the Bay in front of our hunting lodge. There are a quite a number of species of Ducks found here, with Blue Bills and Mallards probably being the favourites. You will see a wide variety of ducks in the early season of September: Mallards, Teal and Wood Ducks. Ring-necked Ducks, Bluebills, Black Ducks, Buffleheads, and Goldeneyes will follow usually in early October. The geese found here are the Canada Goose and the Snow Goose. You will see them flying in a "V" shape. There are usually many Canada Geese as well as Snow Geese, both on the water and in neighbouring grain fields. 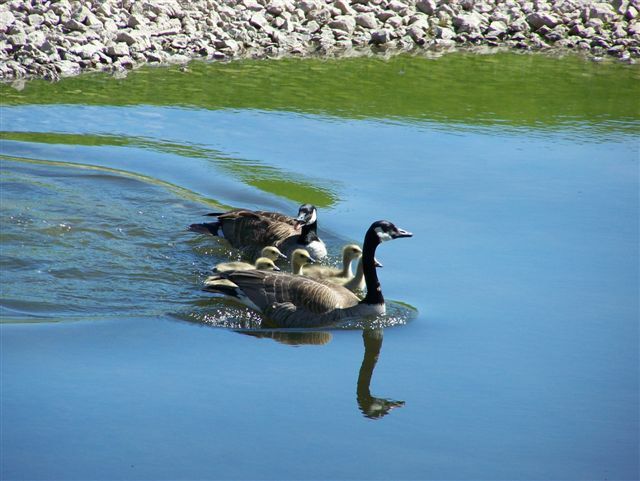 Goose ( goslings ) and Ducks ( ducklings ) hatch in spring and are commonly seen in our harbor on Lake of the Woods. Goose hunting starts Sept 1, Duck hunting starts Sept 10th, Grouse Hunting starts Sept 15, Woodcock Hunting starts Sept 15th. Harris Hill Resort Combo Hunt & Fishing Package runs Sept 15- Oct 15th. Your Modern Fully Equipped House Keeping Cabin with HD Satellite TV etc. View "Lakeview Cabins" for more details and descriptions. You will have your picture taken & either given or sent to you. It may be used on our web site or advertising. Duck Hunting Guides are sometimes available. We can issue the Outdoor Card & Small Game License & Fishing License. You need to present a "rifle" hunt License or Hunter Safety Card to get License here. Duck Hunt across the Bay where we have exclusive rights to hunt Ducks and Geese. Some Duck & Goose Hunters prefer to hunt with their hunting dogs, other Duck Hunters coming to Ontario don't bring Dogs. Duck hunting is successful again on Lake of the Woods. View "Lakeview Cabins" and "Boats & Marina" for more details and descriptions of the Boats & Motors & Cabins. You must use steel shot for waterfowl. Our resort offers quality service, great hospitality, affordable rates, comfortable accommodations.